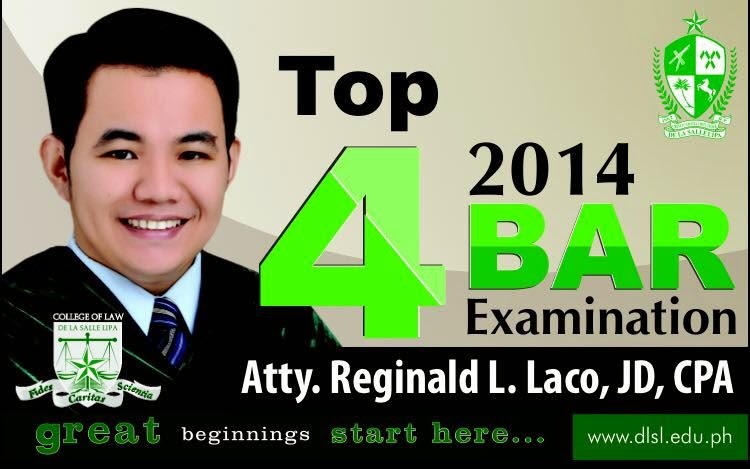 Reginald Laco, the 2009 Certified Public Accountancy nation-wide second-ranked board topnotcher, added another feather to his cap by placing joint fourth in the recently released bar exam results. Laco, who belonged to the maiden class of De La Salle Lipa's College of Law, had a rating of 84.55%, good for joint fourth with Mark Leo Bejemino of the University of the Philippines and Gil Garcia II of Ateneo de Davao University. Irene May Alcobilla of San Beda College - Mendiola topped the bar exams with 85.5%, followed by Christian Drilon of Ateneo de Manila University with 85.45%. Sandra Mae Magalang of the University of the Philippines completed the top three with a grade of 84.6%. In an interview with TV Patrol Southern Tagalog, Laco said that he did not expect to land in the Top 10 because he was unable to prepare for the examinations as much as he would have wanted to. He continued to teach in three local schools as the bar exams approached and was able to do his review only late at night or early in the morning. 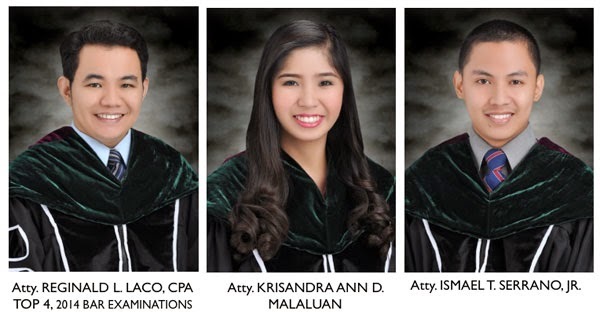 Two other graduates of the De La Salle Lipa College of Law's maiden class passed the bar exams: Krisandra Ann Malaluan and Ismael Serrano Jr.